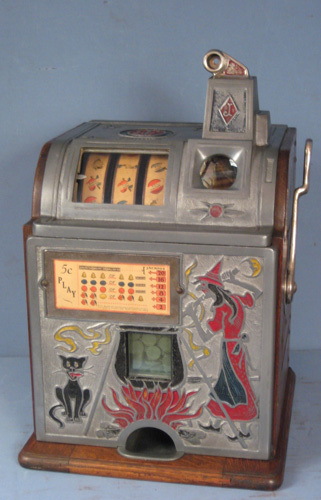 We've had this slot machine since I was young. My father recently gave it to me for my house. I was wondering if it is worth anything in it's current condition also does anyone have tips on cleaning all the mechs? Thanks. Looks like a nice original watermelon slot. Just degrease it where needed and us a fine machine oil like 3 in 1. Worth around 1800.00. Well I am pretty far from you. I live in Pennsylvania. I will take a look at that counter I saw it and had no idea what it was lol. I had the Mech out because there was a jam. I'll have to get it out again and try finding vids on how to degrease it. What is the best method of cleaning without taking it all apart? I'm ok taking the mech out of the cabinet but a little afraid of taking much more apart. I use kerosene and a stiff brush then lube with the light oil.